SAN FRANCISCO (AP) — The robotic car company created by Google is poised to attempt a major technological leap in California, where its vehicles will hit the roads without a human on hand to take control in emergencies. If a bicyclist crosses a road with no traffic signals that’s filled with driverless cars, what will happen? Rhonda Kae Young, a professor of civil engineering at Gonzaga University, says not much. And it’ll probably be safer. “As long as you have a smartphone, you’re going to live,” she said, laughing. With no steering wheel, no pedals, one double-door entrance and little to distinguish its front end from its rear, the driverless vehicle tooling around UW-Madison on Tuesday morning was less a traditional car or truck than a computer-controlled pod on wheels. Driverless cars aren't just theory to automotive engineers anymore. They're busy figuring out how soon next-generation vehicles will arrive on streets near you. OCALA, Fla. (AP) — In 2012, Steve Mahan, who is blind, climbed into the driver's seat of a self-driving car and rolled up to the drive-thru of a Taco Bell in a video that's been viewed more than 8 million times online. YPSILANTI, Mich. (AP) — Michigan's 500-acre (202-hectare) center for autonomous vehicle research is officially open and will partner with technology giant Microsoft. Gov. Rick Snyder trekked to the Ypsilanti-based American Center for Mobility for Wednesday's grand opening. Last year, the site became one of 10 places designated by the U.S. Department of Transportation as "proving grounds" for an automated vehicle pilot program. I don't envy the decisions policymakers must make. There is probably only a 50-50 chance that they can get this right as they stare at a crystal ball and predict the future 20 years from now. But a discussion about infrastructure financing and driverless cars is urgently needed to improve the chances of getting this right. Are driverless cars safe enough to be on the road? Driverless cars offer a future with fewer deaths on the roadways. Today, roughly nine out of 10 car crashes are caused by human error; autonomous vehicles, with their sensors, radars and undistractable computer-driven system, should be much safer. That is, they should be much safer eventually. General Motors Co. will invest more than $100 million in two Michigan plants where it plans to build its Cruise AV driverless car and the high-tech roof modules required to guide the car without a driver. LOS ANGELES (AP) — In a story Feb. 26 about driverless car testing in California, The Associated Press reported erroneously on manufacturers' requirements for permits and the date for permitting applications. Manufacturers can apply for permits starting March 2, not April 2. And manufacturers must provide a plan for working with local law enforcement, not permission from law enforcement for routes and testing. Mention the words "self-driving vehicle" and the name conjures up futuristic images of driverless cars zooming in and out of highway lanes, sand dunes and city streets like in science fiction movies such as "Star Wars," "Minority Report," and "Blade Runner." YOKOHAMA, Japan (AP) — In the future Nissan envisions, driverless cars will pick up children from school and recommend restaurants to tourists in various languages. Nissan Motor Co. says feedback from people who try it will be used to fine-tune its "robo-vehicle mobility service." PHOENIX (AP) — Fiat Chrysler and Google's driverless car company have announced plans to launch autonomous riding sharing services in the Phoenix area later this year. Waymo has been testing some of its self-driving minivans supplied by Chyrsler's parent company in Chandler and the southeast Phoenix area since 2016. It began allowing the self-driving cars to operate on the road without a human in the driver's seat since October. Subaru of America is the latest contributor to the American Center for Mobility, the 500-acre driverless-car proving ground on the site of Ypsilanti's historic Willow Run bomber plant. The Japanese carmaker will invest $2 million at the test center, leaders of the test facility announced Tuesday at the Detroit auto show. AT&T, Visteon Corp., Toyota Motor North America, Ford Motor Co. and Hyundai America Technical Center Inc. are other investors in the center. DETROIT (AP) — U.S. Transportation Secretary Elaine Chao says the auto and tech industries need to allay public fears of self-driving vehicles. 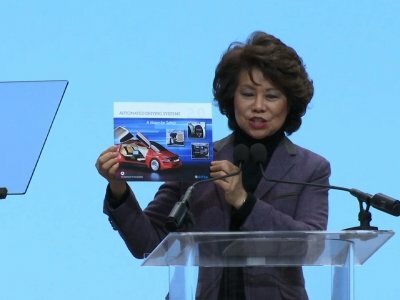 During a speech at the start of the North American International Auto Show in Detroit, Chao cited polling that shows 78 percent of Americans are afraid to ride in a driverless car. She says the government has a role in keeping the technology safe and her department is working with Congress on bills to ensure that. The first market-ready self-driving car is poised to come from General Motors Co., which submitted its federal safety proposal Thursday to put a robotic vehicle with no steering wheel or gas pedal on public roads in 2019. Las Vegas — The automotive industry is finally getting ready to deliver on its long-promised future of advanced, driverless cars. To get to the marketplace first, companies are pairing off to share technology and co-develop business models. The forecast that San Antonio will grow by another one million residents in the next few decades usually stimulates a discussion about traffic congestion. People readily understand that more inhabitants mean more cars and that these additional autos will take up a lot of road space. The American Center for Mobility, a 500-acre driverless car proving ground at Ypsilanti's Willow Run, is open for business. Visteon Corp. and Toyota Motor North America were the first to run tests this week. Others are scheduled to take the track next week. The autonomous test bed has received investments from Ford Motor Co., Hyundai and AT&T. It includes a 2.5-mile highway loop, a 700-foot curved tunnel, two double overpasses, intersections and roundabouts. The next revolution in transportation is expected to be shared autonomous vehicles, with personal cars yielding to driverless ones summoned on demand. Already, Uber passengers in San Francisco, Pittsburgh and Phoenix can hail driverless cars, and Bay Area Lyft riders will soon have the same opportunity. GRAND RAPIDS — A transportation researcher says rural Minnesota residents could benefit from driverless cars. Frank Douma from the University of Minnesota created a task force last year to examine how to give residents across the state access to self-driving vehicles. GRAND RAPIDS, Minn. (AP) — A transportation researcher says rural Minnesota residents could benefit from driverless cars. Frank Douma from the University of Minnesota created a task force last year to examine how to give residents across the state access to self-driving vehicles, Minnesota Public Radio News reported. MILWAUKEE (AP) — As regional leaders prepare for challenges that will result from the massive Foxconn plant in southeastern Wisconsin, the possibility of driverless vehicles is being studied as one way to deal with traffic issues. City planners' ambitious 20-year vision for downtown Houston includes more of everything that has transformed the sleepy central business district into a more vibrant destination. Rain, sleet and snow are challenging enough for human drivers. Bad weather conditions present an extra level of difficulty for developers of self-driving cars that depend on cameras and sensors to "see" the road and make the correct decisions at 70 miles per hour. It's 2027 (or 2037) and the age of the self-driving car. City-dwellers have traded in their car keys for ride hails. Street parking has been replaced by wider sidewalks and bike lanes, while developers are busy converting garages into much-needed housing. CONCORD, N.H. (AP) — A bill under consideration for the next legislative session would allow car manufacturers to test automated vehicles on New Hampshire roads by January 2019. RALEIGH, N.C. (AP) — North Carolina generates half of its $3.7 billion in state transportation money by taxing motor fuels, a revenue engine that could begin puttering out as soon as four years from now, the state's transportation chief told lawmakers on Monday. When the law firm now known as Foley & Lardner was founded in Milwaukee, agriculture was a major part of its practice. Then came clients in the railroad, maritime, banking and manufacturing industries. Now the firm’s practice groups include cybersecurity and driverless cars. Chairman and CEO Jay Rothman said that adaptability to an evolving economy is a big reason it survived to celebrate its 175th anniversary on Friday. ANN ARBOR, Mich. — No ring of the doorbell, just a text. No tip for the driver? No problem in this test, where Domino’s and Ford are teaming up to see if customers will warm to the idea of pizza delivered by driverless cars. Northern New Mexico may be known for its low riders. But is it ready for driverless cars? 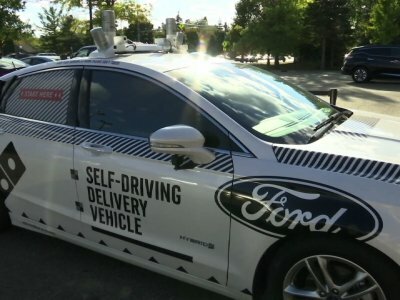 As the world’s biggest automobile manufacturers and tech companies invest in developing autonomous vehicles that can navigate without a human steering a wheel or pressing a pedal, some state officials are calling on lawmakers to put in place policies to address technologies they say could radically change transportation. ALBANY, N.Y. (AP) — New York state has hosted its first ever demonstration of a driverless vehicle on public roads. Democratic Gov. Andrew Cuomo hailed the demonstration as a "major milestone" in the development of a technology that he says is the "next frontier" in transportation.